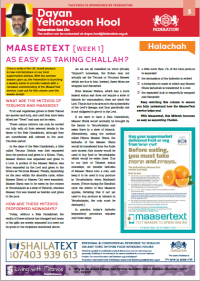 Last week’s column in this MaaserText series focused on the standard instructions for separating maaser. 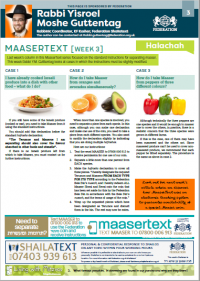 This week Rabbi Y.M. Gutttentag looks at cases in which the instructions must be slightly modified. 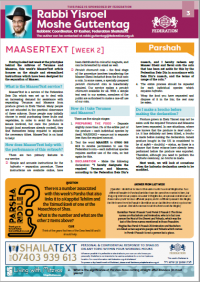 Having looked last week at the principles behind the mitzvos of Terumos and Maasros, this week’s MaaserText article focuses on the simple and streamlined instructions which have been designed for the separation of Maaser. 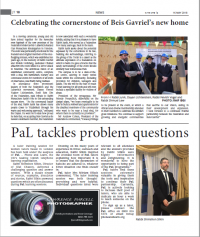 In a moving ceremony, young and old have joined together for the hanochas even hapinah of the new premises of the Federation’s Beis Gavriel- Lubavitch shul and Gan Menachem kindergarten in Hendon. 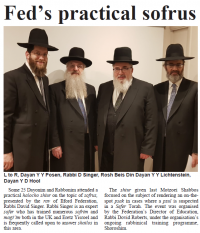 Fruit and vegetables grown in Eretz Yisroel are special and holy, and until they have been tithed are “Tevel” and may not be eaten. 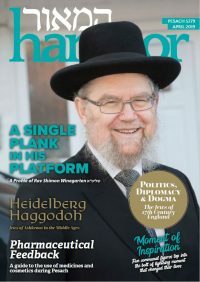 These unique mitzvos can only be carried out fully with all their relevant details in the times of the Beis Hamikdosh, although they are nonetheless still relevant in the post- Churban period. In spite of the incredible opportunity this presents, the Torah commands in this week’s parsha (Vayikra 25:36-37), ‘You shall not take from him interest or increase, and you shall fear your G-d, and let your brother live with you. You shall not give him your money with interest, nor shall you give your food with increase.’ Simply put, we are commanded not to take interest on loans. The UK Association of Jewish Lawyers and Jurists held its first event of 2018 at Littleton Chambers in the City of London. 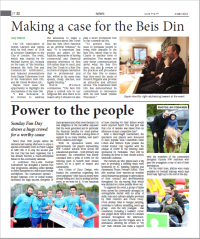 The event, which was chaired by Sir Michael Burton QC, focused on the topic of ‘the interface between the Beth Din and Commercial Arbitration’, and featured presentations from Dayan Yehonoson Hool of the Federation Beis Din, and Mr David Wolfson QC. 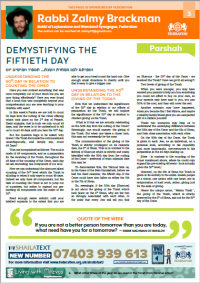 Understanding the 50th day in relation to counting the Omer Have you ever noticed something that was once completely out of your reach but you are now doing effortlessly? Have you ever found that a book that was completely beyond your comprehension you are now teaching to your children with ease? 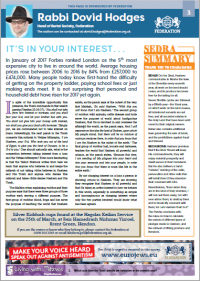 Edmonton Federation Cemetery- Rebbetzin Aviva Landau-published by the Federation of Synagogues. By Eli Kienwald. All cemeteries are hallowed places. A feeling of foreboding and a subconscious fear pervade visitors when they are made starkly aware of the finality of life, of the existence of another world that they cannot see, and of the presence of ancestors who still possess social agency. Perhaps these feelings are mediated somewhat by the realisation that our moral obligations towards the departed are what differentiates humans from the animal world. This creates a continuum between the dead and the living and establishes a bond that is one of the basic tenets of our social structure. The dead cannot bury themselves.